Fondue is a Swiss culinary tradition where you dip pieces of food into a pot filled with melted cheese or chocolate or hot oil or broth. It is a great way for 2 or more people to share a meal or even just dessert, as you can dip fruit into chocolate, bread into cheese, or even cook veggies, seafood and meat in broth or oil. If you get a fondue set for home use, it will typically include a pot to hold the hot liquid, several long pronged forks for piercing and dipping pieces of food and a heating element that’s either flame based or electric. Our best electric fondue pot reviews select the top rated ones that are good for your family or even small parties. An electric fondue pot for oil, broth, cheese or chocolate is safer to use than one with a flame as a source of heat, since it is typically used away from the kitchen and with several people around it. Since the contents of the pot will be extremely hot, a good safety feature to have on an electric unit is a breakaway plug, so the pot is not likely to topple over if someone accidentally pulls the cord. Another advantage of an electric set is the ability to control the temperature. Since these have a probe and thermostat with temperature settings that you can control, even complete newbies to fondue cooking will find it easy to use. If you want to see several electric fondue sets, Amazon is the place to check. Otherwise, read on for our top 5 recommendations. Note that these selections are not small party dipper crock pots. While those are fine to keep pre-melted cheese and chocolate hot during a party, you can’t really use them to melt those ingredients first, let alone cook foods in oil or broth. Those cook foods for a long time at a very low temperature and therefore take a long time to finish a dish. If that’s what you’re actually looking for, we have some very good party crock pot options for you. Another good party tool to have at home is a Raclette grill, and we have reviewed some of those too. With a 3 year limited warranty, no one will complain about the durability of the Cuisinart CFO-3SS Electric Fondue Maker. It heats up evenly and quickly with 1000 watts of power, and the 8 temperature settings are spot on, going to 375 degrees F in 10 to 15 minutes for oil to cook your veggies and meats. Your cheese or chocolate fondue mixture will melt evenly without burning. The 3 quart size should satisfy most situations for dipping and dunking except, perhaps, the largest parties and get togethers. This unit is completely dishwasher safe and immersible in regular dishwater because the temperature probe and magnetic cord are detachable. If you’d rather hand clean it, the brushed stainless steel fork ring, pot exterior and non-stick interior makes it easy as well. The biggest drawback is that the wired base, which makes the pot incredibly stable, is a bit difficult to remove. Keep that in mind when you are thinking about storing the leftovers inside of the pot in the fridge, as you may need help detaching the base. It features a breakaway plug, for extra safety, but the power cord is a bit short, so unless you are close to an outlet, an extension cord may be needed. It comes with 8 color-coded fondue forks and a recipe book. For the price, this is the best electric fondue set available. The Oster 3 1/2 quart fondue pot comes from one of the most readily known small appliance companies, and it shows. The unit is fully immersible and dishwasher safe and the pot can be easily removed from the stand for easy storage. It is an 800 watt unit that will readily heat oil for seafood and meats or melt cheeses and chocolate, and the temperature setting control keeps it exactly at the right temp. A light indicator tells you when it starts and stops heating to maintain a constant temperature. It comes with 8 color-coded fondue forks and a recipe booklet, and for safety sake, it also comes with a short breakaway cord. However, the cord is so sensitive that only the slightest pressure, bump or movement may detach it from the main plug. For some, that may be an issue, but if you have small children about when the fondue pot is heating, an incredibly sensitive detachable cord might save someone from being burned if the cord is yanked and the pot tips over. With this cord, that won’t happen. Cool touch handles allow you to move the pot where you want it at any time, and the brushed stainless exterior gives the look of elegance in any setting. It is the same for the interior as well, but users say it still is easy to clean if you first condition the inside with a bit of oil. If you are looking for the best bang for the buck unit on this list, then the Nostalgia Electrics FPS200 can’t be beat. 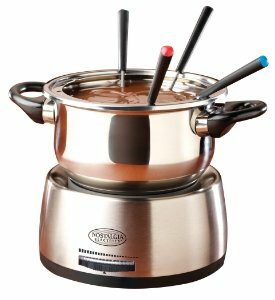 This is the lowest priced fondue pot on this list and it is the smallest at just over 2 quarts but if you’re only using it for fondue for 4-5 people, it works well. While cheese and chocolate will melt fast enough, heating oil or broth may take a while, so if you don’t want to wait, first heat these on the stove before transferring the pot back to its base where they’ll remain hot and temperature controlled throughout. There is no breakaway cord here, so be aware of that if you have kids, but at almost 3 feet long, it comes with the longest cord of the bunch. This is a 2-part unit. The 2 quart pot sits on top of a large base unit that houses the heating coils. The base unit can be damp wipe cleaned, but the actual pot is fully immersible and dishwasher safe. The cool touch handles let you transport it anywhere and it comes with 6 color coded fondue forks and a recipe booklet. If you are looking for one of the most unique fondue pots that will satisfy the cravings of your guests, the Cuisinart CFO-1000 Lazy Susan Fondue Set will fit the bill. All the base features are the same as that of the Cuisinart CFO-3SS model featured above but there are extras to take your party to the next level. The 1000 watt power assures you that your fondue will heat and melt quickly, and the temperature control will keep it at just the right temp for gooey dipping every time. But what sets this unit apart is that it is an electric fondue set with a Lazy Susan and a lid. With four bowls attached to a rotating base, anyone at the table will have access to any of the delicious goodies that are placed inside of them. Just rotate the bowl to where you are sitting, pierce the food item with your fondue fork and dip. Of course with all Cuisinart products, you’ll get a limited 3 year warranty that attests to this products durability. Best of all, this is the only fondue pot here that comes with a cover. That makes it perfect for storing leftovers. Even though this is one of the more expensive fondue makers on the list, the brushed stainless pot with non-stick interior performs well, it comes with 8 fondue forks, a grooved stainless steel fork ring and a recipe booklet, 4 small attachable bowls, and a style all its own. If you want versatility above all else, and are willing to pay for it, the Swissmar FE1003 Zurich 3-in-1 is your only choice. This unit goes above and beyond making fondue, and for some it may be overkill, but for others it may be a gourmets dream. This is a brand that’s also popular in Europe where fondueing is more common. The 1200 watts of power will melt chesses and chocolate in record time, and the breakaway magnetic power cord and control unit will keep it at a very precise temperature. It comes with 6 fondue forks, a splatter guard, a ceramic bowl insert that is removable and dishwasher safe, and a separate electric burner with a base that features rails to keep the pot from tipping over. The burner is what gives this unit it 3-in-1 capability. You use the burner to heat the fondue pot with the insert to eliminate any possibility of cheese or chocolate burning, remove the insert and use the pot for steaming and boiling, or remove the pot and use the burner as a stove top element. Virtually any pot or pan that will fit on the burner will allow you to fry, sauté or grill. That type of versatility is unheard of with any other fondue maker, and if you want one appliance that does it all, this small fondue set is the one for you. The pot is one of the smallest here, with the insert being able to handle less than 2 quarts, however, you can use the pot without the insert if you want.